Don't hide your feet away. Whether you're off on vacation or just enjoying a night out, it's time to ditch those skinny jeans and boots and reach for a floaty skirt and some strappy shoes. Here is how to get perfectly pedicured feet from the comfort of your own home! It's all about the prep: Soft, beautiful feet make taking a good foot selfie much less daunting. You don't want any hard skin or less than perfect toes nails ruining that shot. You don't have to run off to the nearest salon for an expensive pedicure. You can get beautiful, smooth results at home by buffing those soles with the Amopé Pedi Perfect™ Electronic Foot File with Diamond Crystals. 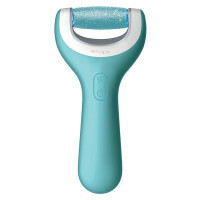 It's a clever electronic device, with exfoliating micro-rollers, which you use on hard skin so your feet are ready for summer, for soft, beautiful feet effortlessly. Just gently roll the Pedi Perfect across areas where there is a buildup of hard skin with a light to medium pressure, repeating regularly to avoid further build up. Professional removal of hard skin in your own home. Pamper time:Once you have gotten rid of any hard skin, give your feet some extra care. Treat tired, aching toes with a relaxing foot soak, especially those that contain green caviar, sea serum and vitamin E as these help to cleanse and soothe weary feet. Just grab a bowl, combine with warm water and sit back and chill! After five minutes, dry your feet thoroughly and then put on some moisturizer. If you’re looking to give your feet some extra attention, apply a product that contains Vitamin B and natural oils, such as the Amopé Pedi Perfect™ Daily Moisturizer. Add some color: Before you take any pictures, refresh your nail polish. You don't want any eagle-eyed Instagrammer commenting on your chipped pedicure. Remove any old polish and spend some time painting your toenails to make your feet look ready for anything. Coral polish always complements tanned glowing skin perfectly, or if you want to make your legs and feet look longer and more luscious try a neutral shade of beige or shell pink – the neutral shade gives the illusion of longer, slimmer toes. Get ready for your close up: Now you've prepped and preened those feet, it's time for their close-up. Grab your phone and experiment with different angles. The best foot selfies are taken from above looking down at your feet, or try lying down on a sun lounger and prop your legs up to get a flattering 'shot from below' effect. 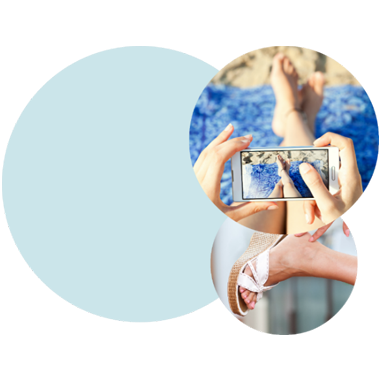 Experiment with filters, tones and lighting before you upload so you’re ready to share your summer ready feet with everyone.